The inspirational words boomed within the walls of the University of Johannesburg’s Soweto Campus’ Imbizo Hall. 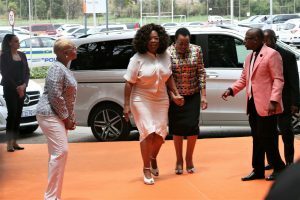 Graca Machel walks with Oprah Winfrey towards the UJ Soweto Campus Imbizo Hall for the commencement of Is’thunzi Sabafazi colloquium. All images Jacob MAWELA. Trademark par for course – they rolled off the tongue of an American icon whose identity is synonymous with success and giving: Oprah Winfrey. Product of a rags-to-riches biography, the luminary dubbed the “Queen of All Media”, was delivering the keynote address to the Is’thunzi Sabafazi [Dignity of Women] colloquium co-organized by the Nelson Mandela Foundation and the Graca Machel Trust, inside the packed, two-tiered venue. That Winfrey, 64, born Orpah Gail Winfrey [as spelt on her birth certificate] even got to address the gathering, referenced to the self-same resilience she allude South Africans as having – considering that the event happened a mere week after she had lost her mother, Vernita Lee, who passed on, on Thanksgiving Day. Yet such is her ties with South Africa that even the death of a loved one wouldn’t dissuade her from honouring an obligation! Falling within the 16 Days of Activism for no Violence against Women and Children period, in addition to the year-long commemoration of Madiba’s centenary – the event’s organizers wouldn’t had chosen a more powerful and universally appealing figure to remind the country’s womenfolk of their place and purpose in Life and society! Although happening on a weekday, locals voted with their feet as droves showed up in affirmation of the message being sent across. Notaries such as erstwhile SA Deputy President, Phumzile Mlambo-Ngquka, Graca Machel, Dr Mamphela Ramphele, actress, Nomzamo Mbatha, Elinor Sisulu, Prince Mangosuthu Buthelezi, Lucas Radebe, Professor Njabulo Ndebele – among prominent others – were out in full force to lend moral support to the gender cause. The occasion attended by well-coiffured and adorned ladies of every colour and diverse age, had commenced with musical renditions from well-known playwright, Mbongeni Ngema and prominent songstress, Zonke Dikana. Performing separately, the duo had guests inside the hall a stomping as Ngema belted out a hit from the Struggle era containing lyrics sounding out the refrain that South Africa would eventually return to the people! Clearly enjoying himself, and all the while suitably dressed up, the Sarafina creator performed delightful shimmies as he sang of “ubabu Tambo a shaya itsamaya!” On a stage adorned with Ndebele matriarch, Esther Mahlangu’s familiar patterns, Dikana owned the space as she evoked the memory of her late musician father as she sang, Viva the Legend – and thereafter concluding her allotted time by leading the audience in the singing of the national anthem. Below a quotation from Madiba emblazoned in huge letters offering: As a tribute to the legions of women who navigated the path of fighting for justice before us, we ought to imprint in the supreme law of the land, firm principles upholding the rights of women – the university’s hall reverberated with elation from the music as a prelude to Winfrey’s address. Cometh her time, elegantly dressed in all-white, the woman who was cruelly referred to as “sack girl” for wearing clothes made from potato sacks whilst growing up being raised by her maid grandmother – stepped up to the podium, to rapturous applause! An orator of the storytelling tradition in her own right, and largely not referencing from her prepared notes – Winfrey got off to a resounding start by greeting the audience in isiZulu, “Sanibonani!” She then related on the moment she got to spend 10 days and nights and 29 meals with Nelson Mandela. Also in attendance being ladies who could attest to experiences of abuse such as Josina Machel and Cheryl Zondi, Winfrey, who at the age of 14 lost a son to complications stemming from being born premature – then delved into what is evidently one of her abiding and proudest legacy ties with the country, the girls school. 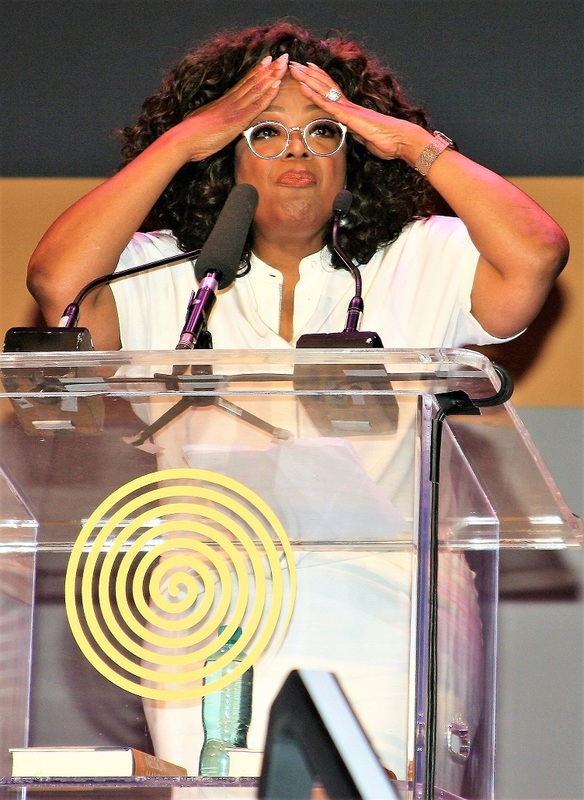 Oprah Winfrey gesticulated whilst addressing the Is’thunzi Sabafazi colloquium at the UJ Soweto Campus’ Imbizo Hall. With the audience enthralled by gems she interspersed her delivery with such as “doing the best at this moment puts you in the best place for the next moment” and, “surround yourself with only people who are going to lift you higher” – the American mentioned that she had 191 girls presently in college, with 20 of them in the United States. Some, she pointed out, graduated from universities in South Africa, the US and Oxford, in England. “The remarkable thing about every single girl who come to my school is all the trials and traumas they’ve been through. Most girls have experienced six major traumas by the time they get to my school and in spite of that, they still rise. And so I say to all the young people, you too can rise. You are capable, you are brimming with the wisdom of all who came before you”, intoned one of planet Earth’s most influential persons who once defied her grandmother by spelling it out to her that she wasn’t destined to follow in her path of being a maid! With Winfrey moving from one theme to another, throughout her talk, it was clear that the young ladies very much formed part of her universe – a point mentioned by renown local talk queen and the event’s moderator, Redi Tlhabi, who let the audience in on what transpired backstage before panellists would occupy their seats at the front. Tlhabi related how almost everyone in sight clamoured for pictures with Winfrey, but that when she spotted the girls – she just gushed over! Teasing that they “didn’t allow men on stage, that’s why he’s seated there” [referring to the Nelson Mandela Foundation’s chairman who was seated in the front row below the elevated stage] amidst a deafening standing ovation inside Imbizo Hall – Tlhabi then beckoned Professor Njabulo Ndebele to join hostess, Graca Machel in handing over a book about Madiba’s prison reflections titled, The Prison Letters of Nelson Mandela – to Winfrey. As Winfrey had to take leave of the event, owing to another engagement – the day’s programme immediately progressed to the colloquium segment which featured Mlambo-Ngquka and the younger Machel. Nelson Mandela/Graca Machel Trust-Ophra Winfrey’lecture at Soweto Campus -UJ,Graca Machel and Cheryl Zondi. Image Sipho MALUKA. former Mozambican president, Samora Machel’s child, relived the ordeal of being left to bleed for around four hours whilst being ignored – in spite of her societal standing – by those she pleaded for assistance from, after being manhandled by her then husband. Machel, who lost the use of an eye from the incident – made an impassioned plea engendering for a community which is caring, ranged against such societal maladies. In a heartfelt engagement, she also mentioned that she was not sure that her mother has healed from what happened to her – adding that, as a survivor of violence, she battled with issues of trust with any human beings. Mlambo-Ngquka, whom Tlhabi declared that she’d had become the country’s president had she not being picked to become a UN diplomat, spoke about the He4She UN initiative, as well as the #HereMeToo local version intended to tackle gender issues face-on. Encouraging the holding of governments to be accountable to the citizenry, she highlighted the lack of implementation of programmes as a focal point of challenges encountered. Delivering the vote of thanks at the event’s conclusion, the Nelson Mandela Foundation’s CEO, Sello Hatang drew the attendees’ attention to remembering victims such as Reeva Steenkamp, Captain Rasuge and LGBT victims, amongst disturbing statistics. Ndebele had summed up the day’s mood when he had earlier in his address, exhorted the guests to listen, learn, engage and walk from the event inspired. At the genesis of the colloquium, a buoyant Graca Machel had offered that the celebrations would have been incomplete sans Winfrey’s presence!